“Democracy,” wrote John Dewey, “is more than a form of government.”1 The image we are given of democracy is often reduced to administration, the implementation and management of the necessary, but the legitimacy of the state in democracies is inseparable from some notion of the general will. Democracy, as Rousseau argued, requires some process for the formation of the “general will,” by reference to which decision-making can be measured.2 The Occupy movement is an attempt to form the general will in new ways. As such, it is a potentially fundamental contribution to resolving the contemporary crisis of democracy. Our argument, written from London, is informed by observations of the occupation outside St Paul’s Cathedral, otherwise known as Occupy LSX, rather than the global range of Occupy movements. We make no apologies for that: one point of the Occupy movement is that it provides a single frame within which many local actions can resonate politically. Our concern is with the fate of the basic idea that makes this resonance possible: What does it entail? Where might it lead? How can it be sustained? It is no accident that John Dewey’s theory of democracy as a social process was formulated, for the large part, during the Depression of the 1930s, the worst financial crisis that the world has seen—at least until now. Severe economic dislocation calls into question the usefulness of the conventional means by which we express the common will: voting, joining political parties, keeping up with the basic news of the day. When national economies are jolted by currency decline, mass unemployment, and a loss of economic activity without much hope of its return, the connections between voting and getting a satisfactory outcome for oneself, for one’s family, or for one’s community are stretched thin. It is exactly such a disjuncture between the democratic process and desirable outcomes that we face today in the fifth year of a global financial crisis that started with the collapse of the subprime market in the United States in late 2007. The contemporary crisis of democracy has been more than thirty years in the making. The gap between democracy’s promise of voice and its delivery is inherent to how market democracies have been run since the late 1970s.3 And yet it is only now in 2011 as a key pillar of the global financial system, the Euro, is threatened and the economies of four European countries are under severe threat, that this gap has started to be consistently challenged. There are in fact two very good reasons why this gap in democracy’s workings has not been challenged until now. First, because the day-to-day finances of contemporary nation-states are entirely determined by the workings of global financial markets: we live in what Colin Leys calls “market-driven democracies,” and have done so for at least 20 years. Second, because a whole doctrine and culture has sprung up that explains the first condition as inevitable, as the “nature” of how societies run. As Foucault pointed out, the idea that ‘markets’ are more fundamental realities than governments has roots back in the late-18th and early-19th centuries, but it only reached mature form in the neoliberalism of Milton Friedman and Friedrich Von Hayek that began to infiltrate Western governments in the mid-1970s. The impact of these two factors on the everyday experience of democracy has been devastating. We have grown used to living in democracies that aren’t working, that is, don’t work as democracies. Apart from ecstatic exceptions when the symbolic meaning of democratic rituals has temporarily been redeemed (Obama’s election in 2008 being the most notable), we know every day the reality of a “post-democracy” where votes don’t count when it comes to the economic domain and economics’ consequences for every other domain of life and government.4 It is an unwelcome truth that we live in societies democratic only in name. The Occupy movement interrupts the bleak routine of counter-democracy. It certainly says no—to bankers bonuses, to cuts, and much else—but as a part of saying yes to the possibility of thinking differently about the political consequences of global markets, to the possibility of challenging the supposed necessities of what the markets “say” and in that way reimagining how democracy may be differently enacted. Nothing could be harder than this. Every day, when we wake up to the news, the economy is presented to us as fate, as nature: instead we need to see it once more “as a site of decision,”6 as a process that is open to democratic accountability. That requires new ways of thinking. It also requires new ways of acting, getting into the habit, for the first time, of treating ourselves and those close to us as citizens with a valid contribution to make to deliberations on how the economy should be run. It means denying to certain others—economic commentators, spokespersons for business and corporate power—the authority to dominate debate on the economy that they have assumed for so long. It means seeing as inadequate (even if welcome) the apparent freedom of decision within the economy granted to the consumer with a credit card. It means restoring economics to the domain of the political and the ethical: the common pursuit of the elements of a good life.7 It requires, in other words, rethinking ourselves as political subjects, as political actors. That is why the imaginative forms of the Occupy movement must be watched with close attention. They are far more than spectacle, even though they often work well as that. 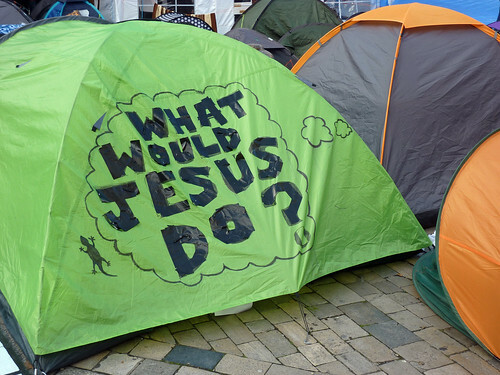 The question painted on a tent outside St Paul’s—WHAT WOULD JESUS DO?—was much more than a smart challenge to the PR sophistication of religious authorities at a prominent site of worship. It was an ethical (and so potentially political) reformulation of questions about the running of the global economy that for nearly four decades have been treated as beyond ethics, beyond politics. What struck us most on visiting St Paul’s was the sense of serious deliberation, the commitment to finding new ways of articulating what is wrong and what must be done. This particular experiment in refinding the general will may fail. That need not matter if the idea of this experiment takes hold. It has already spread through the mantle of the Occupy movement across many countries and been replicated within those countries across many cities. But some plausible successes in expressing the “general will” are needed, so they too can spread and be tried out elsewhere. Longer-term, an even greater challenge emerges: how to link up the successes, if they occur, of the Occupy movement to the wider political process? John Dewey wrote of turning “the Great Society into the Great Community,” but sadly both terms have become devalued through use as cover for neoliberal business as usual. It is not how we describe the process, however, that is important. What matters is the intent, which can only emerge through intense and prolonged collective struggle, to make the imaginative and practical gains of the Occupy movement count in the formal political process and, if this proves impossible, to extend our imaginative work to a rethinking of that political process itself. A number of once placid neoliberal democracies—from Greece to Britain and the United States—are poised to start out on that struggle. As university academics who for now still have the privilege of time in which to think and write, our main task perhaps is to go out from our institutions and listen on the streets, and then, on return, to open our doors. One of the things missing from modern Democracy are tools that facilitate the development and assessment of the General Will. Representation may have been necessary when communication was difficult but in todays world of connectivity it is possible to implement direct Democracy. What this means is a displacement of existing power bases that rely on privileged channels of access to the workings of Government in favor of open and transparent methods for assessing where a civilization wants to invest it’s resources. I believe this transition will be both a struggle and an inevitability.